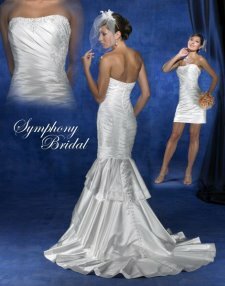 Are you looking for convertible wedding dresses? Then you are a bride on top of a growing trend. How are brides using this unique wedding dress idea? More and more brides are considering wearing 2 dresses for their weddings instead of just one. This is a trend that has been popular for a few years now. Perhaps you to want one look for the ceremony and a different look for the reception. Sometimes this is needed, especially when you will be doing some special dance routine at your reception. But you don't have to always buy two wedding dresses to accomplish this. That now brings to the stage the convertible wedding gown! 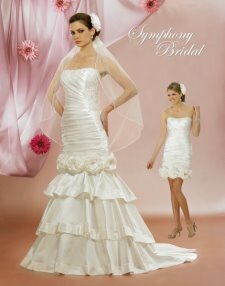 Convertible wedding gowns, also called detachable wedding dresses, have something in common. A skirt and/or train detaches from the gown to form a short train-less style. The short dress can end around the knee or be as short as a mini dress. 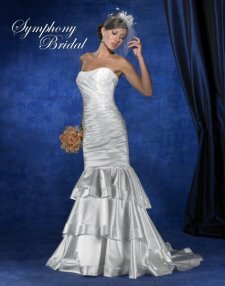 Here are some other gowns that you may consider when looking for convertible wedding dresses. This next dress is designed by Justin Alexander. You can see how versatile this gown is by having a detachable train. Great for a destination wedding dress! I was looking at Jasmine wedding dresses and I came across this convertible wedding dress. It has a detachable skirt and train giving you two different looks! Does anything catch your eye? Your guest will be amazed at your transformation from one look to another! These are definitely wow factor gowns! The above convertible bridal gowns can be purchased from a local bridal shop near you or you can buy them from an online wedding dress shop. Contact me for more information on where to find these gowns!